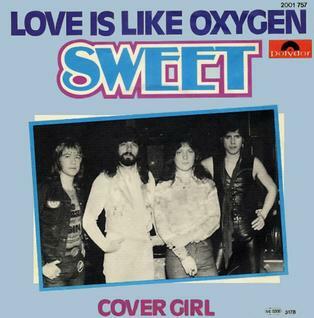 “Love Is Like Oxygen” is a song by the British band Sweet, co-written by the group’s guitarist Andy Scott and Trevor Griffin, a musician who had played with various unsuccessful bands before becoming a roadie and sound engineer, and released in January 1978. The song was a departure from earlier recordings by the Sweet, which were more guitar-driven and featured high vocal harmonies. The extended album version of the song, which appeared on their album Level Headed, incorporates strings and has some disco elements. Their first release on the Polydor label after their departure from RCA, it was also their last Top 10 hit, reaching # 4 in New Zealand, # 6 in Switzerland, # 8 in Belgium, Canada and the United States # 9 in United Kingdom and # 10 in West Germany. Later that year it was honoured with a Song of the Year nomination at the Ivor Novello awards, although beaten by “Baker Street” by Gerry Rafferty. The song is frequently included on greatest hits compilations, usually in its edited single version. Hey – its the short version! !